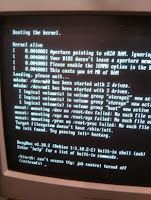 I recently performed an upgrade of my Debian Squeeze server to include the upgrades available in squeeze-backports. After the upgrade, I noticed a lot of dmesg's like the below. In fact, they were repeating every 10 seconds. 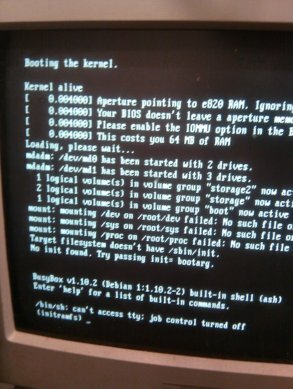 The cause was simple: the ancient monitor I had plugged into the server. It was an HP monochrome monitor from probably the early 90s. Apparently this "target filesystem doesn't have /sbin/init" is a common issue with Debian and derivatives such as Ubuntu. The issue manifested its self after I performed a round of security updates on my server, which included a kernel update. I think that perhaps what lead me to this particular error was that I use a LVM based Linux software RAID1 for my boot partition. Owners of these small mills will know that the Y axis is the most vulnerable to metal swarf and contaminants as the ways can become exposed while machining. The X axis is never exposed directly, and the Z axis is vertical which provides some protection as the chips just fall off. Given I have CNC converted my X3 mill, and have added flood coolant and ball screws, it is even more critical for me that the Y axis be protected.